Beautiful basket, made from Zpagetti t-shirt yarn. Whips up within an hour or so and looks fantastic, don’t you think? I’m quite new to using chunky yarn, but am fast becoming a fan. I’m in the middle of making a cover for a particularly ugly footstool, but have run out of yarn! As if I need an excuse to buy more…. I found the pattern at Crochet in Colour (click the image for the pattern), where I find a lot of my favourite projects. I’ve added this project to Hookin On Hump Day over at Moogly, which is one of the greatest crochet blogs around! This entry was posted in Hookin On Hump Day, Projects and tagged basket, chunky yarn, crochet, DIY, handcrafted, handmade, hookin on hump day, pattern, zpagetti. Bookmark the permalink. Oooo now I really want to try that yarn! I saw that Lion Brand is selling it. Love the color you chose. 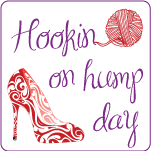 Thanks for sharing at Hookin On Hump Day! This looks lovely! I made a cat bed with the Zpagetti yarn but I found it really tough to crochet with and I injured my wrist, did you hve any problems with it? I did find it tough going at times – I think I made this basket with double strands too. But because it was a straightforward stitch it moved along really quickly. I hope the wrist injury recovered well, yikes! Haha yes it did fortunately! It did put me off Zpagetti though, I might have to give it another go and see if I get on any better with it this time! Don’t forget to check second hand sites, or online market places to pick some up, I find there are some great bargains that way. Enjoy, it’s a lovely basket and folds up to lie flat too.